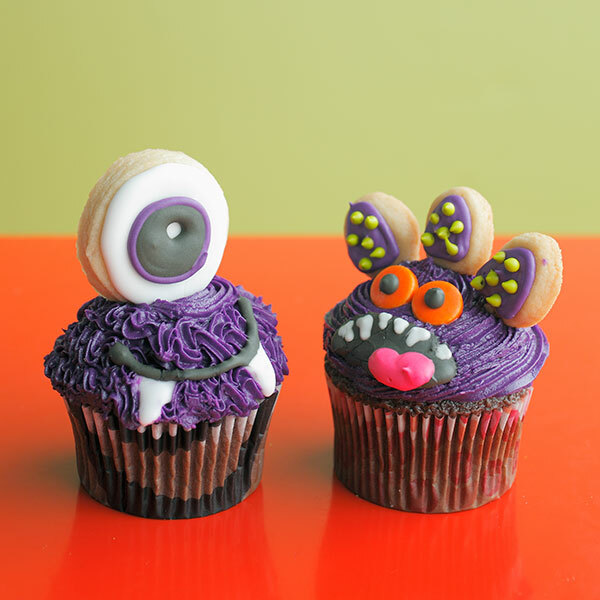 With just cookies, candies and a little of Em's Royal Icing and Buttercream Frosting recipes, you’ll be ready to unleash monster mayhem in your kitchen. Royal icing works great for adding details like stripes, dots and tiny monster teeth—just be sure to let it dry between layers of colors so they don’t run together. In a grease-free mixing bowl (glass or metal), beat meringue powder and water until powder is dissolved. Add confectioners’ sugar to mixture and blend until incorporated. Mix on low until its consistency looks like glue. It should be runny, but not too thin. Divide your frosting into smaller bowls, according to how many colors you are going to make, and quickly cover each bowl with cling wrap. When you are working on these cookies and cupcakes with royal icing, these tips will come in handy! When mixing the icing, you will want to use the lowest speed on your mixer. High speeds create air bubbles, and you will have to pop them with a toothpick later. Mixing slowly eliminates extra work later. Check the consistency with this trick: Take a spoon, and dribble some over a plate. It should run off the spoon, and about 30 seconds after it’s hit the plate, it should be smooth without any peaks. Royal icing starts air-drying immediately. You’ll know if you’ve waited too long to cover it if a crusty, shiny skin begins to form on the top. You can scrape it off the top with a spatula if needed. But do not mix it in because it will not go though an icing tip, creating clogs and frustration later. When drawing with royal icing, use a very small, round tip. I prefer a tip 4 for filling backgrounds and a tip 2 or 3 for smaller detail work. Outline the shape first, and then go back and fill it in, like a coloring book. If you are creating designs with multiple layers, like the black mouth with white teeth and pink tongue, you need to let the first, bottom layer dry (about 1 hour) before you start layering designs on top, otherwise they will sink in and run. They need to “sit” on top of that first layer.